In John 6:1-15 we read about Jesus, the disciples, and a large crowd of hungry people. Jesus provides a meal for all the people even though the only food available was 5 loaves of bread and 2 fish. There is so much in this account to study and savor. However, this post is going to be about what happened next. Jesus invited me to linger with Him recently in John 6:16-21. He gently brought to my mind some points that I hadn’t noticed before. The disciples had finished gathering 12 baskets full of leftover bread and fish pieces. Don’t you wonder what they must have felt like as they pondered the miracle they had just witnessed? They didn’t just witness the miracle but Jesus had allowed them to actually be a part of what happened. Imagine being one of the crew cleaning up after this picnic. Well, we could easily stay here, but let’s move onto the evening and see what happens next. We know from John 6:15 that Jesus had gone to the mountain alone. We find the disciples at the sea. Do you find it perplexing that the disciples would leave without Jesus? John does not tell us but in Matthew 14 and Mark 6 we read that Jesus had instructed the disciples to leave. Picture yourself at the scene. Would you quickly jump in the boat with the disciples or desire to stay behind with Jesus? When I imagine myself at the scene, I am reluctant to leave Jesus. I want to stay and wait for Jesus to return or maybe He even invites me to be with Him on the mountain. I certainly don’t think I would be eager to join the group in the boat. Or would I? What about me now, today? Do I wait or do I rush ahead? I’m sorry to say that there have been many times that I didn’t wait for Jesus. They ventured out onto the sea after dark, rowed for miles and the wind was blowing hard. The disciples struggled in their own strength when they had to make the trip without Jesus. So different from just a few hours earlier when they were basking in the afterglow of a miracle. Have you had this kind of experience after proceeding without Jesus? I sure have. At first, the disciples are fearful but then they see it is indeed Jesus. Jesus has arrived walking on the water. As soon as Jesus entered the boat they were suddenly at their destination. So much here in verses 19-21 to discover and I hope you will spend some time exploring. I am so glad that Jesus will come get me when I have gone out in my boat without Him. But I don’t want to live like that. I want to be where He is always. Jesus is my destination. Make it your goal to be with Jesus, stay with Jesus and follow Him. It’s not about you fitting Him into your plan. It is His plan for you to follow Him step by step, moment by moment. I hope that last week’s post was an encouragement to devote yourself to Bible study. This week I’d like to share some helpful Bible study resources. But first, a few tips that you might find useful. ∗Prayer is the first step to Bible study. First, pray about what God would like you to study. Watch and listen to what specific Bible study the Holy Spirit is guiding you to do. ∗Plan is about gathering what supplies will be needed. Where will you keep your Bible study book and any other items for the study? I would suggest that these things be kept in plain view at least until you have developed a solid habit of study. If your materials need to be portable you could put everything in a tote bag to carry with you. Planning is also needed to decide on a specific time each day that you will spend on the study. Establish a certain time because otherwise, it will be very difficult to develop consistent study. ∗Place is deciding on a certain spot that you will usually do your daily study. It should be somewhere that you are comfortable and undisturbed if possible. I like to be flexible about the place. If I can go outside for Bible study that’s an added plus for me. ∗Persistence is so very important. If you enthusiastically start your Bible study but then fail to finish for whatever reason, don’t give up Bible study! It is not easy to establish this wonderful practice of consistent study. Ask yourself some questions to find out how you can improve your experience. Was it the right study for you? Did you follow the tips – Pray-Plan-Place-Persistence? ∗Don’t add another P for Perfect to the list of tips. It’s not about doing everything perfectly or like someone else. 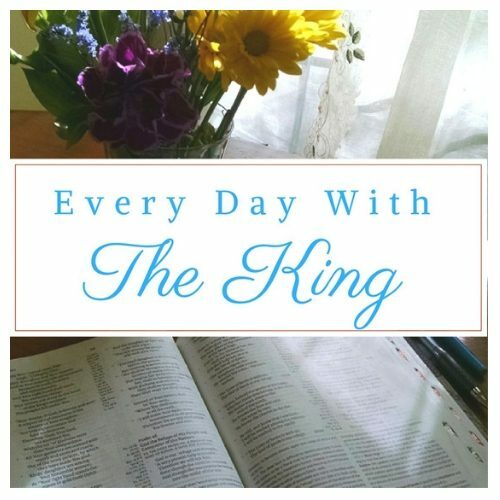 The important thing about your study time is spending time with the King every day. Please don’t give up. It might be difficult to get the habit established but so very worthwhile. Please click on the link below to go directly to the Bible study page. There is also a tab on the menu that goes to the Bible Study Page. This page is loaded with plenty of Bible study resources including the links and is kept updated with current information. I pray that you will explore and enjoy. Bible reading and study is for all believers. The Holy Spirit will gently guide you along on a special study program just for you. If you love to study and are able to learn new things easily, that’s great. But, natural abilities and study skills are not required. As Corrie’s quote above says, you will have the ability to learn because of the Holy Spirit. I sometimes think about how wonderful it must have been to actually sit at the feet of Jesus. What could be better than being with Jesus, listening to Him, as the disciples were able to do? However, Jesus says we are actually better off now than the disciples were when they sat with Him. The Holy Spirit is just like Jesus in the flesh except the Holy Spirit is within us. Jesus sent the Spirit to help us, to be our guide, teach, remind and enable us. So we have all we need to learn at the feet of Jesus today because we have the promised Holy Spirit within us.